High definition (HD) has been with us for a decade and now it makes a huge leap to a higher-than-1080p resolution: 4K UHD. 4K UHD refers to a pixel resolution of 4096x2160 (4,000 pixels, 8.8 megapixels, 17:9 aspect ratio) which is mainly used in digital cinema, or 3840× 2160 (8.3 megapixels, 16:9 aspect ratio) for Ultra HD TV. With the popularization of 4K, users can now enjoy videos and movies with staggering vivid details. While 4K is relatively new, users inevitably find that devices supporting 4K are rather limited and sometimes a special 4K video player is a must but which may cause platform incompatibility issue. Why bother? You can enjoy 4K movies/videos freely with a proper 4K video converter. Here we introduce you top three 4k converter software to help you convert 4K to 1080p, 720p and other more commonly-used formats or upconvert HD videos to UHD for higher image quality and better enjoyment on 4K TVs or so. Warm prompt: The internet is rife with many so-called 4k 2160p video converters. Some can only downscale 4k to HD 1080p videos for wider compatibility with HD TVs, smart phones, tablets, etc. But hardly can they cope with HEVC codec in 4K UHD videos, let along handling the HD to 4K upscaling. It's also disappointing when you find some tools perform a lengthy 4k video conversion because upconverting 4K UHD videos is much CPU consuming. Given speed, HEVC compatibility, and quality into full consideration, here we introduce the best 4K 2160p video converter software. Wanna Convert Large-sized 4K Video at Faster Speed? 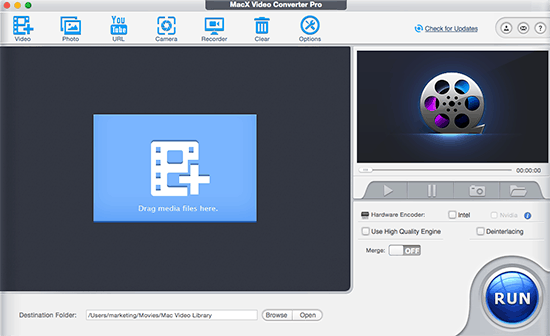 Try on MacX Video Converter Pro, world's unique Mac video converter with both (Intel QSV) and GPU (Nvidia/AMD) hardware acceleration techs supported to dramatically improve 4K video processing up to 5-8X faster than ordinary converters. Convert 4K video from any format to MP4, H264, HEVC, MOV, AVI, etc. 200+ formats. Compress 4K video to 1080p/720p or reduce 4K file size via trim/edit features. Hardware accelerated speed to process 5GB 4K video to H264/H265 within 5 mins. 1. Feature the abilities to both downscale and upscale 4K UHD video, e.g. compress 4K to 1080p/720p or convert 720p to 4K UHD, or 1080p to 4K. 2. Preset profile for 4K HEVC is much preferred, so that you won't tweak any video parameter settings and the 4K UHD video will be downsized up to 50% smaller than H.264. This is especially helpful if you need to upload 4K to video sharing sites or store the UHD videos in small-space iPhone like 16GB. 3. Quick converting process is King. Adobe forum indicates that a 3 minute 4K video takes 24 hours to export. This can be problematic, especially when you want to convert a 4K full movie. 4. The ability to preserve the quality the same as original is favored especially in 4k to HD/SD video converting. This 4K video converter software is a professional video toolset which integrates 4K video converting, compression, downloading, recording and editing into one. It is specially designed to convert and compress 4K videos (3840x2160 or 4096x2160) into MKV, MP4, HEVC/H.265, H.264, AVI, MOV, FLV, WMV, etc for hassle-free playback on iPhone, iPad, Samsung, HD TV, Game console, and many more with untouched video quality. What impresses you most is the No.1 fast speed in 4K video processing. Fueled by the advanced Intel QSV and Nvidia/AMD GPU hardware acceleration tech, MacX can complete compute-intensive 4K video conversion and compression task at 5-8X faster speed, up to 250-320FPS. Thus, a 5GB 4K video conversion can be finished within 5 mins only! Make use of CPU cores (up to 8) and apply QSV tech to decode/encode 4K videos in a flash, up to 5X faster 4K conversion speed than others. Offer 4K MP4/H.265 profile that makes HD to 4K video converting with ease instead of setting resolution manually and reduce file size greatly. High Quality Engine and deinterlacing manage to deliver better quality, especially in the course of 4K to 1080p compression. Convert & compress 4K UHD to 2K, 1080P 720P HD SD videos without quality loss. Upscale HD video to 4K MP4 and convert videos to HEVC with smaller file size. Transfer 4K videos to iPhone X/8/7/6s (Plus), iPad Pro, Android, HD TV, etc. Download 4K YouTube videos and convert to MP4, AVI, MOV, etc in one click. Capture on-screen 4K movies, videos with high quality. Edit 4K videos: merge/trim/crop/rotate videos, add subtitles. This HD video converter is also an easy-to-use 4K UHD video converter which allows users to convert various HD videos, including 4K UHD and other source files into many different video and audio formats beyond HD (high definition), including MP3, WMA, WAV, M4A, AAC, AC3, JPG, PNG, GIF, BMP, SWF, etc. This 4K converter runs on both Mac and PC, for $60. But the stability and performance of this 4K video converter software does not live up to that price. Expensive and too much CPU occupied. No 4k video downloading option available. No support for HEVC codec, that means the file size of encoded 4K video will be 50% larger than with MacX Video Converter Pro. Wondershare Video Converter Ultimate is also among the most powerful and user-friendly HD video converters for Mac, which enables users to convert 4K ultra HD, HD and SD videos into other high definition or standard definition videos, including WMV, DV, MKV, FLV, AVI, MP4, DAT, MPG, NUT, MPEG, NSV, VOB, MOV etc. This is a very simple and professional 4K video converter & compressor, with fast speed and nice editing features. However, the Mac version is also priced at $60. 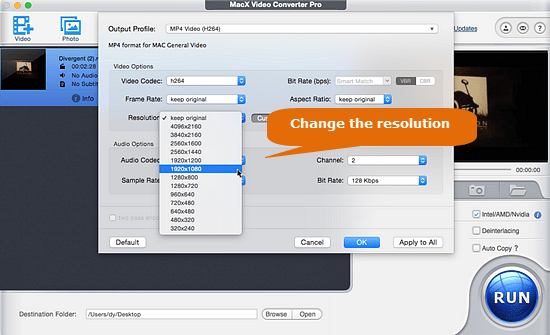 Support HEVC/H.265 codec as MacX does. Offer preset profiles for VR headsets. The batch converting feature has some limitations. Sound is not perfectly in sync with the converted 4K video sometimes. The 4k video conversion is very slow. Test shows that Wondershare is 4X slower than MacX in 4K UHD hardware encoding test. 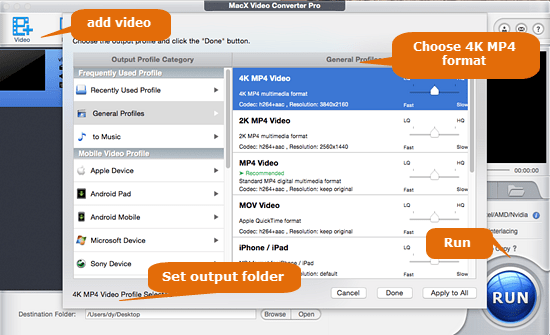 From the above we can see, MacX Video Converter Pro tops the list of best 4K converter software, both functionally and economically. This 4K video converter, upscaler and compressor can cover all your needs about 4K videos, including 4K UHD video converting, compressing, upconverting, downloading, recording, and editing. Whether taken by professional camcorders, digital cameras, mobile phones or downloaded from 4K streaming sites like YouTube, Netflix, etc, it can easily convert 4K videos into MKV, MTS, MP4, MOV, FLV, WMV, AVI, etc in 1920x1080, 1280x720 and other HD or SD resolutions, greatly extending the usage of 4K on computer, HD TV, smartphone, tablet, media players that won't support UHD video. Unlike other video converters that don't support compression codec HEVC of 4K video, it makes good compatibility with HEVC 4K video and even manages to convert 2D, 1080p HD video to 4K video encoded in HEVC, greatly enhancing the video quality yet managing to keep smaller file size. The 4K to 1080p converter is distinguished from other video converting programs when it comes to speed. Upscaling and downscaling 4K UHD videos can be done at lightning fast speed, because it supports Intel QSV hardware encoder technology, hyper-threading tech and takes advantages of the CPU cores to greatly accelerate the conversion speed. P.S. The specially deisgned Windows version enables Windows users to convert videos to/from 4K UHD as you did on Mac computers. So choose the right version of 4K video converter according to your computer system. Step 1: Free download this big-league 4K video converter on Mac, or for windows users, just go to the windows version. Launch it and click "+ Video" to load the 4K UHD video files you want to convert. Step 2: Select the output format and resolution you desire. You can freely convert 4K to 1080p, 720p or other resolution as you want by choosing the respective parameters or directly choosing the 2K MP4 as the output format. You can also adjust the aspect ratio to 16:9 for playback on 4K UHD TV. Step 4: Click the "RUN" button to start to compress/convert 4K videos on your Mac. Step 1: Click "+ Video" button to load the source 1080p HD video. You can add multiple HD videos at a time as it supports batch conversion. Step 2: Select 4K profile. From the pop-up profile window, you can simply choose the 4K MP4 encoded with H.264 as the output format. To get smaller file size and better quality, you are advised to choose MP4 HEVC from the Mac General Video or MKV HEVC from the PC General Video, and then upscale the video resolution from 1080p to 3840x2160p or 4096x2160p from the video parameter settings. Note: You can check the High-Quality engine and move the slide bar to HQ to enhance the output quality, if you are less care of the conversion speed. Now you may have an idea of how to convert 4K video content into the formats or devices you need with the top 4K video converter, but where and how can you get those 4K contents? In addition to those taken by 4K-capable digital cameras or camcorders, are there any providers or video-sharing sites offering 4K movies or videos? Surely yes. We list three main 4K content providers here below to enable you get a quick sneak peek at those super vivid pictures labeled 4K. • Netflix: Netflix was one of the first services to provide 4K contents, starting with House of Cards. 4K contents that are now available including series like Game of Thrones, House of Cards, Breaking Bad, and The Blacklist, as well as a few 4K movies including Ghostbusters, Ghostbusters II etc. And more contents in 4K are rolling out according to the company. • Amazon Instant Video: Amazon also offered support for 4K Ultra HD streaming on the Amazon Instant Video in 2015 with some original contents in 4K UHD versions, including season 2 of Alpha House, Transparent, and the concert Tony Bennet and Lady Gaga: Cheek to Cheek Live! Many other 4K movies and originals will show up in 2015. • YouTube: As the largest video-sharing site, YouTube has announced the availability of 4K 60 fps videos since 2010. After more than 4 years' development in 4K videos, YouTube has built a 4K video library that is larger than you may think and now a channel labeled 4K is added to highlight the 4K 60fps contents. 4K Video Download with 4K Converter Software? Possible? How to download 4K movies and videos on your devices? Any special tools needed? As a matter of fact, this best 4K UHD converter MacX Video Converter Pro also serves as a 4K UHD video downloader, which has a knack of 4k uhd video download, including YouTube 4K video samples, music videos, movies, clips, 4K torrents etc. free from YouTube and other video websites and convert them to your desired formats or devices. Can I watch 4K video on Mac or Windows Computers? You have to bear in mind 4K UHD videos are nitpick over the computer configurations, such as resolution, graphic card, etc. If they are not highly configured, it may crash when playing 4K UHD videos. So far, MacBook Pro late 2013 and later, 27'' iMac late 2013 and later, Mac mini late 2014 support playing 4K videos. See the best 4K video player for Mac. While for Windows users, the computer with 8GB RAM is recommended with integrated graphics: 4th generation Intel Core processor and above version. If you fail to play 4K videos, it's suggested to downscale and convert 4K videos to lower-resolution video, e.g. in 1080p, 720p, which is so far the mainstream format nowadays. • What 4K TVs are available now? 4K TVs are popular nowadays. There are many tvs supporting 4K UHD resolution, ranging from manufacturers like Sony XBR49X850B 49, Samsung UN65HU8550, LG Electronics 55UB8500, etc. See the top list of 4K UHD TVs. You can upscale videos to 4K UHD and play them on the 4K TVs with better crisper image enjoyment experience.